2CV – the battle against corrosion – HubNut – celebrating the average! Today marked the start of my latest battle against corrosion with my 2CV. First, a quick history trip. I bought my 2CV in the summer of 2000 for £450. 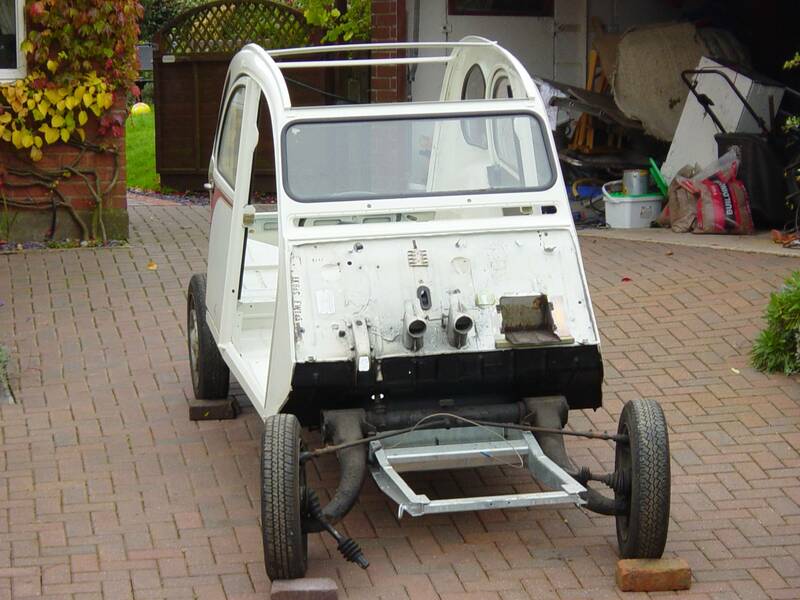 It was largely solid – or so I though – but the chassis was going to need work. A bit of patching kept it going for two years. A full resto began in 2002. That saw the old chassis thrown away, and a galvanised replacement fitted. The bodyshell received new floors, lower bulkhead and sills, while the boot floot was patched and one seat belt mounting in the rear replaced. Elly returned to the road in 2003, looking much the same as when she’d left it. All the external panels were the same! In late 2005, the second stage began. The body was stripped and all panels refurbished before a full respray. A new complete windscreen panel was fitted as the old one had rotted out at the top. This work was completed in early 2006, which we celebrated by driving all the way to a quaint town in Wales called Aberystwyth, not thinking we’d live near there a few years later! I thought I’d banished the rot, but I was wrong. It’s very hard to stop steel corroding. After a few years, new sills were needed again. The replacement sills had simply rotted from the inside out, despite wax protection. A year or so after that and the bonnet hinge had rotted out again. The paint cracked in several places all over the bodyshell, and gave rot the perfect reintroduction. Powder coated items suffered the same. One slight break in the surface and the metal was eaten out beneath the coating. I won’t waste my money on powder coating wheels or other items again. It doesn’t work. As Elly sits now, the windscreen panel is rotten again, the front floors and lower bulkhead were replaced last year, the powder coated bumpers and headlamp bar are in a truly dreadful state and hints of corrosion can be seen almost anywhere you look. I was pretty horrified to look under the car fairly recently to discover the rear floor was starting to hang down in places though! Time for action. Today, that action began. The 2CV was jacked up, the rear suspension shock absorber, tie rod and arm were removed, the fuel filler neck and rear wing were then removed and work could begin. A chisel and bare hands were enough to remove a fair bit of metalwork, with an angle grinder adding to the attack. What I’m holding in my hand is largely held together by paint and sealant. The metal had crumbled readily and indeed, cutting back to good metal soon saw yet more bits of car landing on the floor of the workshop. A quick patch job turned into something much more involved. This surprised me not at all. I’ve been here before! After that? It’s hard to say. The budget simply doesn’t exist for a full makeover, but I’m utterly failing to keep on top of the rot at the moment. If I’m not careful, she’ll just simply fall apart. Welding her up myself isn’t an option, as that in itself requires a fairly serious investment to start with, and development of the necessary skills. I’m as likely to take up welding as I am flower arranging. It’s just not me. For now, it’s a case of ‘do what’s necessary’ and then focus on jobs I can do. Like replacing the headlamps, because one of them is full of water (well, it isn’t now, but the bowl is completely rotten), making sure the lights and brakes work and keeping the kingpins greased! Hopefully, she’ll be in for a test next week.